The best tool to convert PST file to EML format which supports by Windows Live Mail, Zimbra, Zoho Mail, Microsoft Entourage, Thunderbird, eM Client & etc. Support EML based clients such as Windows Live Mail, Window Vista Mail. PST to EML converter can convert PST file to EML, MBOX, EMLX, HTML, MSG and other file formats. Message Filtration Options to export PST data between Two Specific Dates. No file size limitation to convert PST data to EML. Preview option to show preview PST file data with attachment before conversion process start. Export PST files items Inbox, Outbox, Sent items, Folder, Sub-folder, Contacts and Calendar etc. PST to EML Converter allows saving PST to EML data to desired file location. It is risk free software; no data will be loss during the conversion process. Software allows converting password protected file. Support all the latest version of Microsoft Outlook and Windows. *Demo Version Recovers and shows a complete preview of data but it converts first 30 items per folder. PST to EML Converter can export PST file into multiple file formats such as EML, MBOX, EMLX, HTML, MSG, PDF and other file formats. This software also converts Contacts and Calendar into vCard and vCal. This software provides you an option to convert PST file into Office 365 and also in Live Exchange sever account. This software can securely convert PST file to Office 365 account with all PST mail items (Inbox, Outbox, Sent items, deleted items, folder, sub folder & attachments) etc. PST to EML converter maintains all the Meta properties of the PST email while converting into EML format. Outlook to Windows Live Mail conversion software maintain keeps the Meta properties including (to, bcc, cc, subject, from, & attachment) etc. PST to EML converter tool ensures that every bit of PST file data can be recover & convert into EML file formats. The software deeply scans the Outlook PST file and get data from highly corrupted, damaged, & inaccessible PST file. This PST Conversion Software shows preview of all PST item including email attachment after scanning process. You can click on particular item to check preview of data & you can check email properties including attachments. PST to EML converter is a best tool to convert particular contacts and Calendar. You can separately export your contacts and calendar by using VCARD and VCAL. It contains all the information while converting contacts and calendar. PST to EML Converter tool supports all the latest version of Windows & Microsoft Outlook. Windows Operating System: Windows 10, 8, 8.1, 7, Vista, XP. Microsoft Outlook: Outlook2016, Outlook2013, Outlook2010, Outlook2007, Outlook2003. *Free download enables you to check PST file contents and save initial 30 messages. 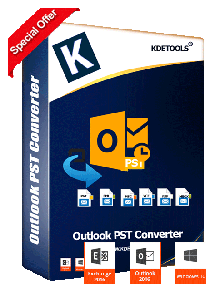 KDETools OST to PST Converter exports OST files to PST, MBOX, EML & 10+ email clients. 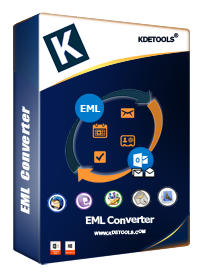 KDETools EML file converter helps users to convert EML/EMLX files to PST, MBOX, MSG, PDF, & etc.